The A-4 was built by the Goodyear company for the US Army in April 1919. She was the product of a post-world war I environment when the Army was struggling with how to employ the airship in military operations. In 1919, Germany dominated the field of airships and had used them successfully in reconnaissance and bombing operations. 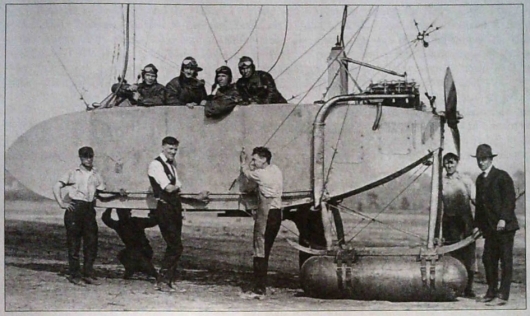 Germany already had "rigid" airships in WW I, and the US had none! So the acquisition of the A-4 was actually a very major milestone in the quest of the US Government to enter into the airship playground. The A-4 was 95,000 cubic feet in volume, spanned 162 feet in length, and was 33 1/2 feet in diameter at is maximum girth. She relied on one Curtis OX-5, 70 hp engine for propulsion and used a single, 2-blade propeller. (The engine eventually replaced with a Rolls-Royce engine and 4-bladed propeller.) Her useful lift was 2,224 pounds and she could sustain a cruise speed of 35 mph with a maximum speed of 46. She was limited to an altitude of 8,000 feet. (This means she could not ascend over the Rocky Mountains if she tried! But that, of course, is not the point! She was designed as an "entry point" for the US into the field of airships, and in that role, she performed admirably!) Reader Thomas Norris reports that when the A-4 was constructed, she was fitted with Goodyear envelope No. 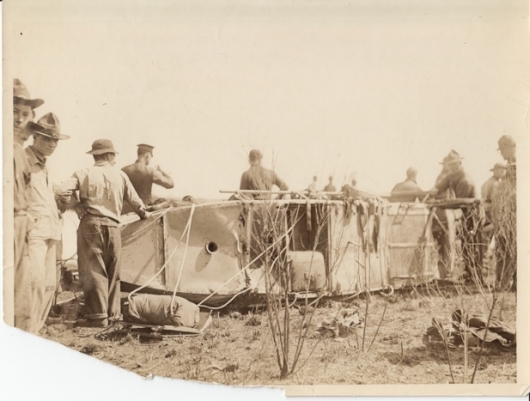 D-43 and inflatable pontoons. Sometime between 7 November 1919 and 4 December 1920, she was fitted with a new envelope - probably Goodyear No. D-46. Her lower vertical fin was also modified and the inflatable pontoons were removed. The A-4 had a long an distinguished career. After acceptance by the Army on April, 22, 1919, she was delivered to Langley Field, Virginia and began trials as a training aircraft. 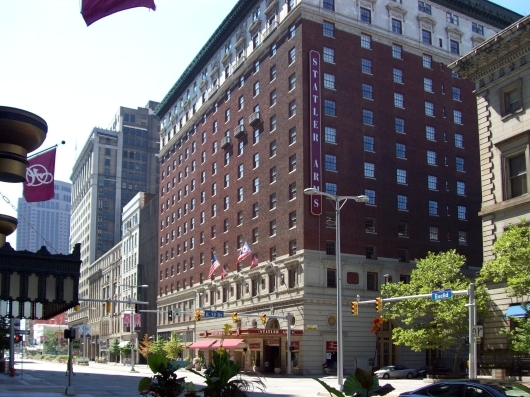 Very early, given her ability to manage 12 hours of cruise time, one of her first "tests" was to carry Ralph Upson, the Chief Engineer for the Goodyear company, to Cleveland, Ohio where Mr. Upson was to deliver a speech on airship design to the Society of Automotive Engineers. 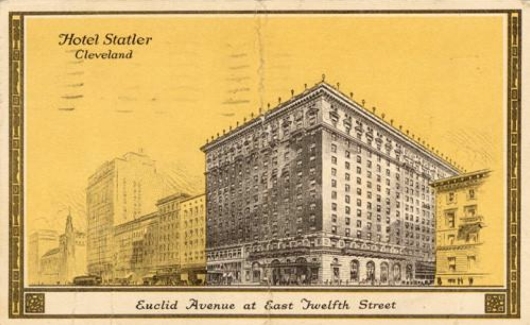 During this test flight, the A-4 actually landed on the top of the Statler Hotel - the site of the Automotive Engineer meeting! (See photos herein). In September, 1920, the A-4 flew in formation with two other training airships and participated in demonstrating radio communication with the ground. She was transferred to Scott Field, Illinois in July, 1922. In late 1922 she participated in experiments with free balloons, and on one occasion flew round trip and non-stop with sister airship, the Mullion, from Scott Field to Springfield, IL. In December, 1922, the A-4 even delivered "Santa Claus" to the Scott Field Officer's Club to the delight of party-goers. In February, 1923, she made a demonstration landing on a football field in Belleville, Illinois. Also in February, 1923, General Billy Mitchell flew on the A-4 during an inspection of the Army Airship School at Scott Field. Actually, the end of the A-4 is shrouded in mystery! Airship author James Shock says in his "U.S. Army Airships 1908-1942", page 35, says the A-4 was "dismantled" sometime in 1923. 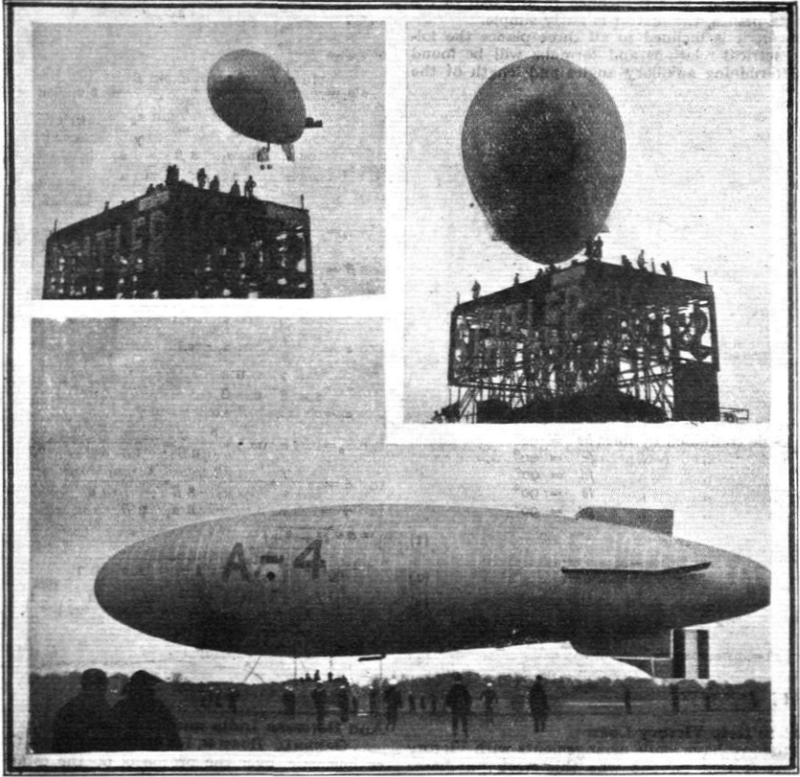 A citation, the last I could find on the A-4, in the "Air Service Newsletter" for April 14, 1923 states: "AIRSHIP A-4 OVERHAULED. The Engineering Department at Scott Field, Ill., is taking advantage of the bad weather to improve the condition of the Airship A-4. A new Rolls-Royce, 6-cylinder motor is begin installed, with a four-blade propeller similar to the one used on the Mullion Airship. The new propeller will increase the speed of the ship and make for smoother flying." No further entry about the A-4 is found in any source I was able to find. The mystery is that I came across an undated photo which appears to show the control car of the A-4, crashed on the ground! (See "Mystery: What became of the A-4? ", below.) Not only was I unable to confirm or date the photo, but with no record of an accident, I simply had to throw up my hands and admit defeat! The A-4 served admirably in a time when great experimentation on aerial warfare was being conducted in the U.S. Army. The A-4 served as the training vessel for Ambrose Clinton, and once carried Brigadier General Billy Mitchell in February 1923! (See "Air Service Newsletter" for March 5, 1923, page 4.) The fact that the fate of the A-4 is unknown is ignominious indeed. 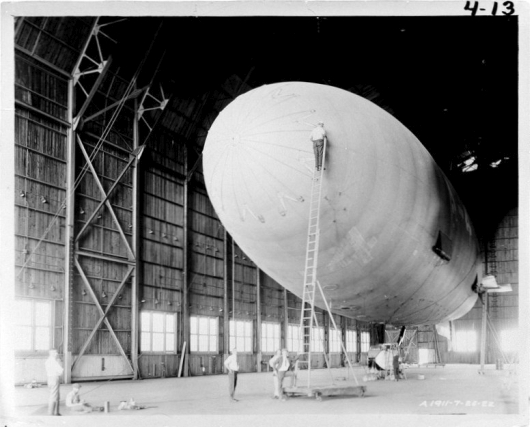 The marking on the photo above, "A 1911-7-26-22", is decidedly NOT the year "1911", as the Goodyear company reports that the hangar was built in 1917. This photo's date may be instead "26 July, 1922" when the A-4 might have been back at Goodyear for repairs. The map tack above is at (Lat Lon) 41.008552 -081.361258. 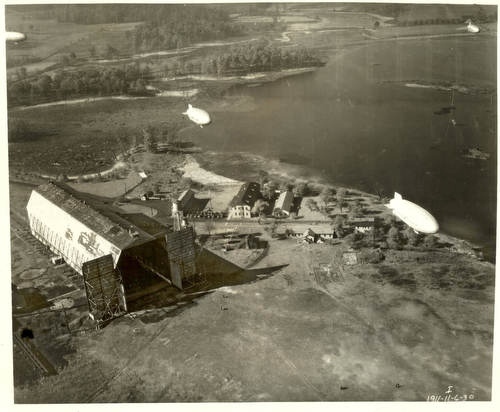 The photo above may be 6 November, 1930, and 3, possibly 4, unnamed blimps are in the photo. 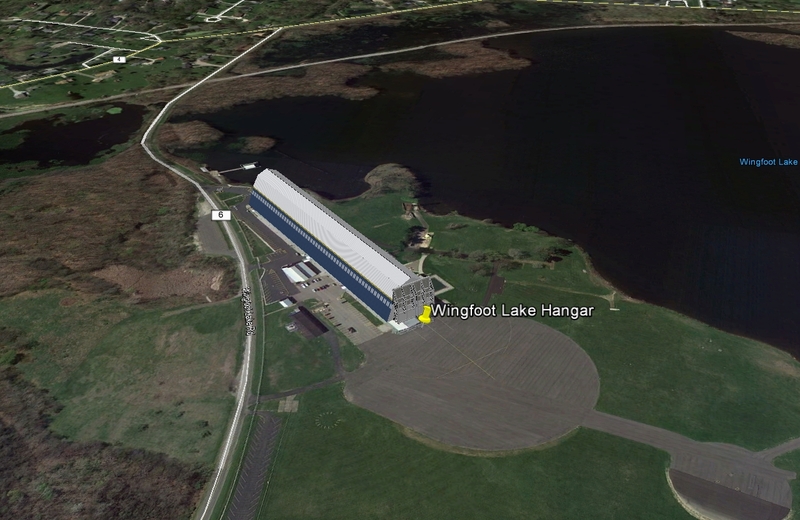 The buildings seen near the lake shore were sill present in a 1943 photo of the site, so a 1930 date for this photo is not unreasonable. Photo credits: "Flight" magazine, July 10, 1919. Mystery: What became of the A-4? I located Mr. George Brett, and sent him a question about the origin and date of the photo, but never heard anything from him. The photo remains a mystery. Between the two photos, the general shape of the control car is pretty much the same. Though we are seeing the bottom of the control car in the Brett photo, and the side of the car in the Shock photo, there are items to examine: The hand-hold rail in the Shock photo appears possibly longer than the hand-hold rail in the Brett photo. The lower part of the engine exhaust pipe in the Shock photo appears "flattened", while in the Brett photo it appears "cylindrical". The inflatable pontoons (removed by December 1920) attached to the landing skids in the Shock photo are clearly missing in the Brett photo. The structure of the underside of the car in the Brett photo is simply not visible in the Shock photo. The differences in these photos is easily explained as simply a difference in the dates of the two photos. The Shock photo is dated April, 1919, making it around the time of delivery of the Airship to the Army. The Brett photo, if of the A-4 Control car, must be 1923 or later, so the differences in the photos possibly demonstrate nothing more than 4+ years of operation and modification. I realize I am probably the only person on the entire earth who wonders what happened to the A-4, but given its history, its role in the US Army, and the fact that General Billy Mitchell flew on it, I'd really like to know the fate of the A-4! The Brett photo sure looks like the control car of the A-4, and gives the impression the A-4 crashed. The fact that the A-4 was sent for an overhaul in April, 1923 and never written about again seems to support the "dismantling" theory. If anyone has any additional information to share, I would be most grateful if you'd contact me.